Seventh-grader Ruby Asuncion, left, and senior Andrew Hahn illustrate the range of age groups that attend Nanakuli High and Intermediate School and why some members of the staff and community want to see it split into separate schools. Since 1969, Nanakuli High and Intermediate School has served students from grades 7 to 12. While this configuration has served the students fairly well over the years, there is a growing consensus from NHIS staff and community members that the school needs to be split into two separate schools: one serving grades 7 to 8 and the other serving grades 9 to 12. This desire to change the configuration of NHIS is due in part to the perception from community and staff members that the high school students have become negative role models for the intermediate students. Kimo Keli'i, Waianae Coast Neighborhood Board Education Committee chairman, said, "We're concerned about the current situation of our school. Times have changed. Demographics have changed, and student conduct and behavior have changed. The middle and high school appeared to be an excellent idea back in the late '60s, maybe '70s. As decades have gone by, we've discovered that this mixture of intermediate students mixed with high school students has been a recipe for disaster." Some issues that intermediate school students face include being on a large campus as well as being with a wide range of ages. Intermediate school Vice Principal Gavin Tsue said, "For incoming seventh-graders, it makes it difficult for them to be on such a large campus as well as to be with older students. Another concern is sometimes they see things done by older students such as smoking, cutting out of school, as well as peer pressure, which sometimes lead them to follow such activities." Many students also feel that having the intermediate and high school mixed together produces negative results. Sophomore Frances Manuma said, "Having intermediate students mixed with high school students is a bad idea because the intermediate students do not have enough experience to know that what some high school students are doing is bad." However, some students feel the combination of intermediate and high school is positive. Senior Nate Momon said, "It is a good idea because the high-schoolers can influence the middle school and show what they can do." The process of separating NHIS involves a presentation to the superintendent and the Board of Education as well as a decision from the BOE. Dennis Tynan, teacher representative for the School Community Council, said, "The process involves the BOE's decision. We will be continuing to push this agenda forward on the board's agenda." If the separation becomes a success, 12th-grade counselor Dr. Leigh Ann Siaosi said, the advantages would be, "We would get more money because we'll be counted separately, and so I think with the weighted student formula, I think we'd be able to receive more money per grade level." Other advantages, according to Tynan: "Authority, discipline and control procedures can be more age-appropriate for the seventh- and eighth-graders. Also, things like assemblies and schoolwide events sometimes are not as productive as they could be because it involves seventh- through 12th-graders, whereas you have specific things just designed for seventh- and eighth-graders, and other things are designed for ninth- through 12th-graders. It is just a little more age-appropriate." Construction workers, drilling tools and new buildings could soon be seen in the Nanakuli community as construction of the Nanakuli Village Center takes shape. On Sept. 15 the Nanakuli Hawaiian Homestead Community Association celebrated the groundbreaking ceremony for the future center. The ceremony consisted of prayer, song and dance as well as speeches by dignitaries such as Lt. Gov. James "Duke" Aiona, state Rep. Michael Kahikina, Department of Hawaiian Home Lands Chairman Micah Kane, City Councilmember Todd Apo and many others who all shared their gratitude and excitement toward the ceremony and the outcome of the project. The Nanakuli Village will be a place that will be beneficial to all community members and also will be one of the largest centers from Pearl City to Kaena Point. There will be three major complexes, which will be located in the current Camp Andrews site. "It's a realization of a vision that the community of Nanakuli had about a gathering place where people can meet and have job opportunities," said project manager Kale Watson. The front of the village will be a commercial center where native Hawaiians can own their own businesses and learn about economic development. "There may be things made by Hawaiians, for Hawaiians, and selling it out and guaranteed 100 percent Hawaiian-made products," said NHHCA President Kamaki Kanahele. Mark Oto, left, state Rep. Michael Kahikina, City Councilmember Todd Apo, Esther Kiaaina, Lt. Gov. 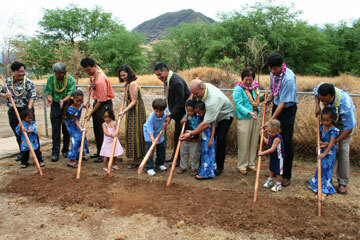 James "Duke" Aiona, Micah Kane, state Sen. Colleen Hanabusa, Kale Watson and Kekoa Kaluhiwa joined kids from the community to break ground for the Nanakuli Village Center. The second complex will be a multipurpose building located in the back area of the village which will hold 1,200 people. This will be used for student activities, performances by school clubs and programs and community functions. "We always want to integrate the lifestyles of the local Hawaiian people and the community," said architect Hannah Wong. The third complex will be a surfing hall of fame designed by Keoni Downing. State, federal and county agencies are joining numerous fundraisers in this project -- "whatever it will take to build our building," said Kanahele. According to Kanahele, the village will be used and managed by native Hawaiians. Students from grades five through 12 can work in these buildings like adults, with the same jobs and income. "We're going to find the best consultants and the best skilled people to come on to Nanakuli to train and manage the students," said Kanahele. "We are also going to use the staff from all four schools in the complex to help develop training in high technology." The date of the village's completion has not been determined, but Kanahele hopes it will be completed in the next five to six years. "My first date would be a big lavish dinner and then a movie and a night on the town." "I would go out to dinner with my date, and I would call all my friends to come with me to share this first date of mine." "I would go to Kapolei movies and then tell him, 'Take me Zippy's.'" "I would go out to eat and have a stroll on the beach during a sunset." "I would just go to the mall and a place to chill to get to know each other better." "I would go to the Spaghetti Factory and then to the movies, and then I'd walk on the beach with her under the moonlight." "I would go to see a comedy movie, then go to the Cheesecake Factory."